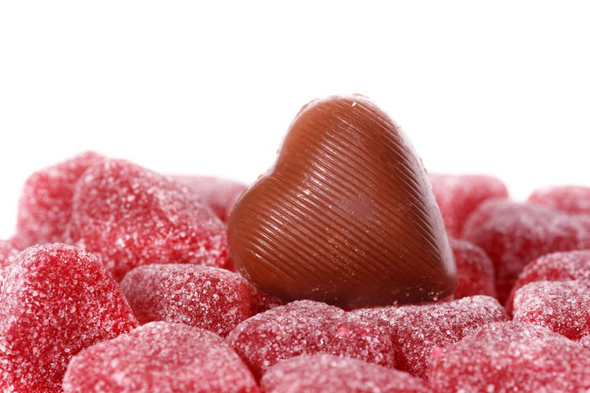 It is an irrefutable fact that the best thing about Valentine’s Day is those red chewy gummy hearts. As I eat them, they get stuck in my teeth in the most wonderful way, making it impossible to stop eating them until the entire package has happily relocated into my stomach. And things just taste better when they come in heart shapes. Besides that, I tend to resent February 14. I hate that it reminds me that I want a boyfriend, I want an engagement, I want a husband, I want contentment, I want desire, I want my own personal love. In college, I had some drastic friends who inspired me to wear black with them for Valentine’s Day as a unified symbolic “in your face!” to all things red and pink and happy. We walked smugly around campus all day proud of our defiance. We don’t need love, we don’t need anything. Or some crap like that. I’m fractionally wiser now. I know (and admit) that I very much need love. And yes, I still tend to hate/avoid Valentine’s Day. I hate that it amplifies the one love I don’t have, because I have so much love thrown at me by the people in my life who love me right now. I’m not going to deny that I want romantic love (I am a human, after all), but when it comes to Valentine’s Day this year, I’ll focus on getting my hands on some of those fantastic red gummy hearts.